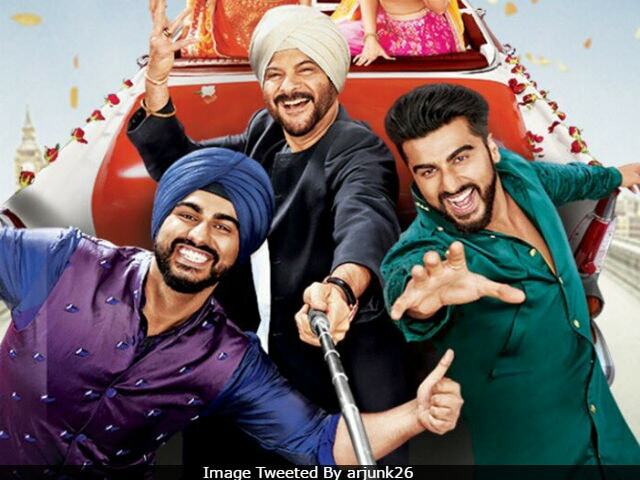 Arjun Kapoor, who will co-star with uncle, actor Anil Kapoor for the first time in Mubarakan said that working with the latter turned out to be a 'blast,' reports news agency IANS. In Mubarakan, the chacha-bhatija duo portray their off screen relationship. Arjun stars in a double role (Karan and Charan) while Anil Kapoor plays their uncle Kartar. "It's a blast (to work with a family member). Before the film began I was also keen to see how this pans out because I have not experienced this before. But it turned out to be a blast because you get to hang out with your family. Learn, work and watch a man who's iconic and a legend do his work," Arjun, 32, told IANS. Mubarakan is directed by Aneez Bazmee, who has earlier made films like Welcome, Welcome Back, No Entry and No Problem with Anil Kapoor. The film also stars Ileana D'Cruz and Athiya Shetty, opposite Arjun. The trailer of Mubarakan was absolutely a laughter-riot, courtesy Katar Singh and his humour. (Here's proof). "At the same time, after 30 years my relationship with him can go up another level is only because we spent so much time working on a film. So, I think I am very happy about Mubarakan," Arjun added. Of sharing screen space with Arjun, Anil Kapoor, 60 earlier told PTI, "It has been a wonderful and emotional experience working with Arjun. Someone asked me if there was a rivalry between you two on sets, because you're relative. He's my brother's son. In fact, he's like my own son. But I never call him Arjun, I call him Arjun chachu." Arjun Kapoor is the son of filmmaker Boney Kapoor. Mubarakan releases on July 28.